Tuesday July 28th 1896 Laura helped me wash this morning. Mr & Mrs Garrison with their daughter were here for apples. Will was down town in the morning and went to the valley late in the afternoon. Mary Price came for Laura and after they were gone I finished up some work I had left in the forenoon and did the regular evening work. weather quite warm. Wednesday July 29th 1896 I ironed this morning and baked a cake for Edith. Will finished sowing grass seed about three oclock and e went down town and over the river to let the folks know we would not try to go to Oxford to Ediths birthday picnic. It was six oclock when we left town so it was about bed-time when the evening work was done. a warm day. 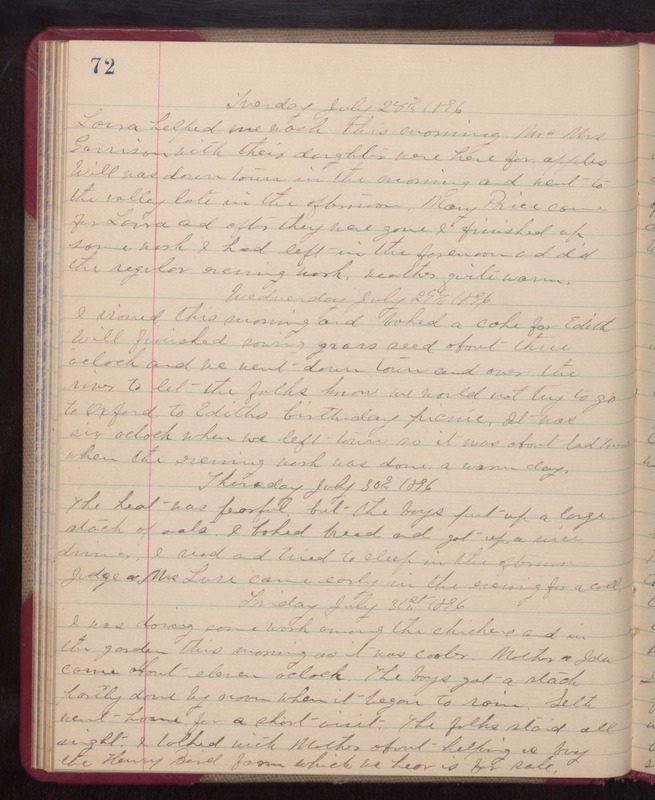 Thursday July 30th 1896 The heat ws fearful but the boys put up a large stack of oats. I baked bread and got up a nice dinner. I read and tried to sleep in the afternoon. Judge and Mrs Lase came early in the evening for a call. Friday July 31st 1896 I was doing some work among the chickens and in the garden this morning as it was cooler. Mother & Ida come about eleven oclock. The boys got a stack partly done by noon when it began to rain. Seth went home for a short visit. The folks staid all night. I talked with Mother about helping is buy the Henry Bird farm which we hear is for sale.